This year’s Giffard West Cup sure put the 22 finalists through their paces. 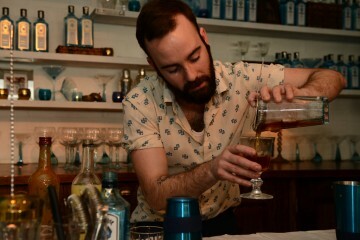 Taking in bartending talent from all over the world including Singapore, Vancover, USA, UK, France and Scandinavia each of the contestants had to show off their skills in two separate challenges to demonstrate their creative and improvisational skills. 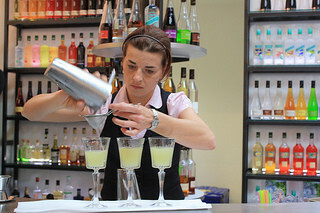 In the Concours de Création round they were asked to produce an original ‘short’ cocktail using one spirit base and at least a 10ml measure of one Premium Giffard Liqueur. Matteo Saba of Tek Bar in Arezzo, Italy, created a Positano (Abricot du Roussillon Giffard Premium Liqueur, Wild Turkey Bourbon, fresh lime juice, Curaçao Triple Sec and Rosemary infusion), while Anu Apte of Rob Roy in Seattle devised a Mumbai Sour (Fleur de Sureau savage Giffard Premium Liqueur, Ginger of the Indies Giffard Premium Liqueur, City of London gin, fresh lemon juice, egg white and saffron strands). The second round was a little more demanding. 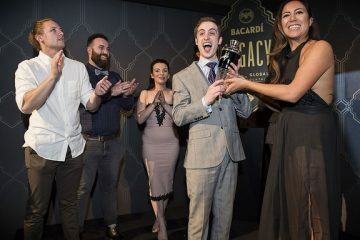 Each competitor had to come up with a short drink taking their pick from five ingredients from a mysterious black box, as well as a minimum of 5 ml Menthe Pastille, 10 ml of one Bigallet Liqueur and a choice between China China, Genepi Grand tetras or Thyme liqueur. And they only had half an hour to come up with the goods.